There was a time when officious scientists held out climate change warnings and boisterous activists would take the issue out on to the streets. They still do that. But increasingly, celebrities are also warming up to climate change. On July 7, pop stars and a panoply of celebrities lent their voices at Live Earth, a series of concerts to raise awareness on climate change. 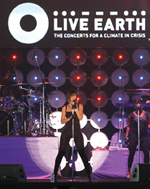 Organised by former us vice-president Al Gore, the show saw star names like Madonna and Red Hot Chilli Peppers appearing at events in the us, Australia, Brazil, South Africa, Japan and China. The organisers hoped this would be a "call to action" on global warming. "We hope that Live Earth will launch a global campaign giving a critical mass of people around the world the tools they need to help to solve the climate crisis," Gore said. Some, however, remain sceptical. "Many in Hollywood and in the music industry simply see global warming activism as another trendy crusade to be a part of," said a political commentator. "Although celebrities are more than happy to do the talk, they are unable to do the walk when it comes to reducing their overall carbon footprint because of their luxurious lifestyles," he added. Gore isn't oblivious of the event's limitations. "Ultimately, corporations and governments must become global leaders taking decisive action to stop global warming," he said.